Stone Wolf Guitars is a 2 man team comprising of Mike Payne & Martin Pape. Mike is our luthier and has been building guitars for the last 8 years, while Martin is our support team dealing with all the finer points of running a business. 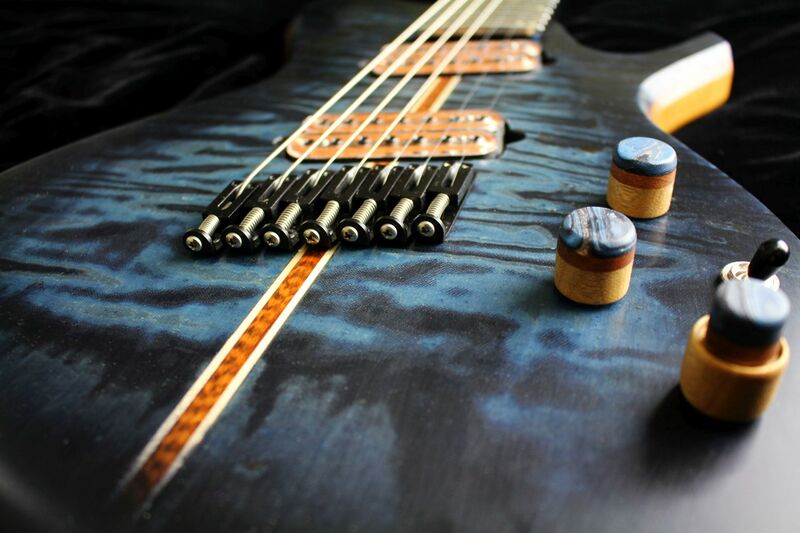 We handbuild all our instruments and have a very open minded attitude when it comes to building methods as materials, as seen in our liberal use of resins, exotic burls and layered fabric tops. We’re always looking to do something interesting and different but still keeping the core belief that everything must be built to an extremely high standard, using the highest quality components that we can obtain. We love doing custom commissions for people and bringing their wild ideas to life! Mike is our luthier, and he’s been building guitars since 2010. He started building as a hobby, despite not having any previous woodworking experience. He was however, well and truly bitten by the bug and has turned guitar making into his passion and livelihood. He loves experimenting with new techniques and materials and finds fun in coming up with non-conventional ways to build. Mike is also a proud member of the “EGB – European Guitar Builders Association” and is passionate about furthering the world of custom guitar builders. Martin is our business manager and support team. He deals with all other aspects of the business, apart from building guitars. From taking care of mechandise, to PR, Martin can always be found out front & centre at any trade show. He’s looking into learning how to build bass guitars and hopefully in a few years will be making basses for the Stone Wolf stock. 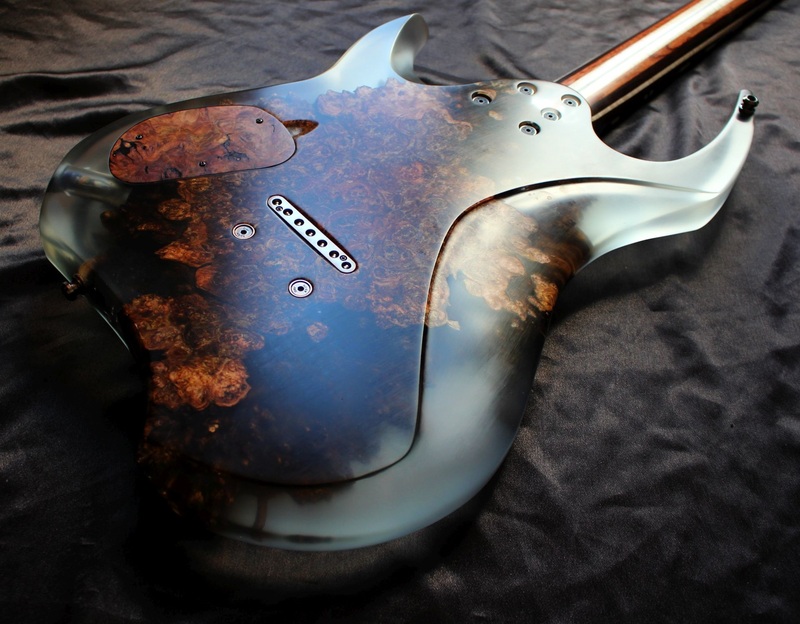 All of our guitars are 100% hand made, using no CNC machines or automation. We love making these instruments and want to keep the build process as “hands on” as possible. We’re not afraid to experiment with build materials and our resin/wood hybrid series is a perfect example of this. While we believe wood should still be at the heart of a guitar, we don’t shy away from adding synthetic or otherwise non-traditional elements to our instruments. Here is an interview with Mike, our luthier, about his approach to building guitars. The back of a Catalyst 7 with light reflecting off the resin and black poisonwood. Our customers are encouraged to be as involved as they wish, and we’ll keep you updated at every stage of the build. Customers are also more than welcome to visit our workshop to see the build as it progresses. Mike is also a proud member of the EGB – European Guitar Builders Association. We hope you love our guitars as much as we do and we’re always willing to take on your dream guitar and make it a reality.